The word is out and the local blogs are bouncing to the reverberation of this years Glasgowbury festival. The only problem is that most seem to have taken a look at the line up and chosen to talk about the few rather than the many. It’s almost as if everyone has just taken the headliners on each stage and laid out reviews of the fashionable instead of understanding the ‘Small but massive’ ethos behind the festival and immersing themselves in the new and the fresh rather than the usual suspects of the Northern Ireland music scene. Well I’m here to take you on a journey through the unsung heroes of Glasgowbury. The hidden gems that graced the many stages with reverence and surprised the gathered crowds. These are the ones to watch, not the ones to be seen to watch. First up would have to be Derry band ‘Swanee River’ who graced the Spurs of Rock stage. These guys are the epitome of Classic Rock and are Glasgowbury veterans. Their special brand of Rock with a lick of Blues was just what was needed to kick start the madness. With songs like ‘Bouncy Castles’ and ‘The Dose’ they rocked the crowd from start to finish and constantly shone with the experience and enthusiasm of a band made for the festival circuit. The first show to turn a tent inside out as the crowd bounced, sang and cheered to the dirty sound of ‘Swanee River’. The second act that made my favourites list would have to be the ‘Yes Cadets’ on the Small but Massive stage. The Belfast band has a solid base within the Indie genre with a shade of electro-funk to blow the cobwebs off any festival goer lucky enough to catch them in action. As if their set wasn’t enough to attract the attention of those milling between stages, it was their cover of Corona’s 1994 dancefloor hit ‘Rhythm of the Night’ that really made the crowd stand up and take notice. It definitely served as the icing on the cake of a stunning set that lifted the crowd to it’s feet and certainly imprinted on the minds of many as a highlight of the festival. Last but most definitely not least was ‘Junior Johnson’ at the G Spot. As a previous winner of the L.A. Music Awards Folk Artist of the year, Junior is no stranger to the stage. His unique blend of acoustic folk and Americana with a hint of the man in black knocked the crowd for six. Out of all the acts who graced the G Spot none seemed to draw the same crowd as Junior nor could replicate the atmosphere when his golden voice first rang out with the ‘Ballad of Glasgowbury’, the song that made such an impact at last years festival. Followed closely by the stunning track ‘City Girl’ he kept the crowd in buoyant mood as they revelled in the sui genaris sound rarely heard in this day and age. Out of all the acts at the festival this is the one I will be keeping a close eye on. A dark horse who graced the smallest of stages with the greatest of impact. Watch this space. 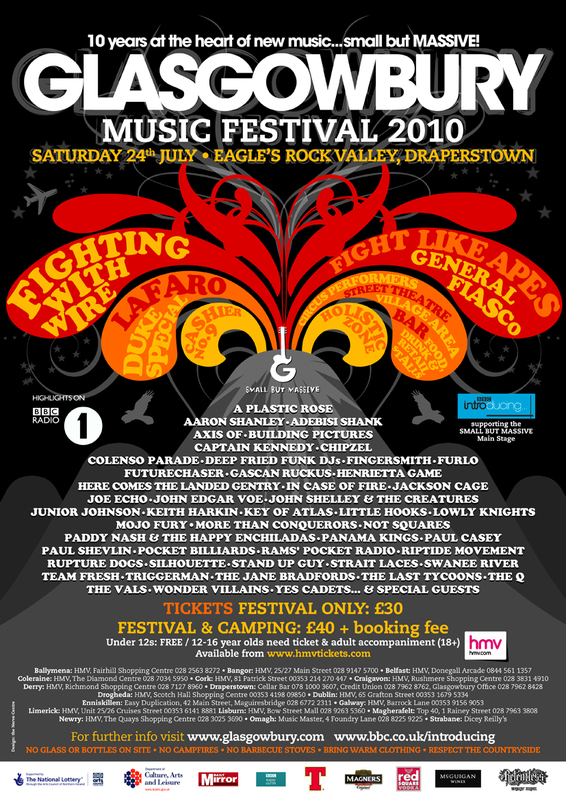 So there you go, a sample of the acts that made the Glasgowbury experience special for me. Performers a festival like Glasgowbury is made for. Fresh, unique and definitely the ones to look out for in the future.